I can’t tell you how many times I’ve heard parents say that their children respond to consequences by yelling “I DON’T CARE!” Nothing seems to bother these kids, or so it seems — not even losing their cell phone, T.V. time, or having an earlier bedtime. My goal in this blog post is to prove to all of you parents, once and for all, that your child’s attitude doesn’t have to interfere with your ability to help them change their behavior. Believe me, even though they may be shouting “I don’t care” there are still ways to parent effectively. Situation #1: Kids learn quickly what kinds of things to say that pound (forget push!) your buttons and how to invite you to arguments that you can’t resist. James Lehman often reminds us that kids would much rather argue about something than do what we’re asking of them. Some parents have a huge button with neon flashing lights on it, detailing their frustrations about whether or not their child cares and what kind of attitude their kids carry into situations and tasks. Again, if this is you, it hasn’t gone unnoticed by your child. Saying “I don’t care” is effective bait to lure parents into arguing about how they think their child should feel. How to handle it: Say something like, “It’s okay that you don’t care, but it’s your responsibility to do your chores,” then walk away. Situation #2: As a parent, you use your authority to make rules and set limits that will help teach your children the acceptable and unacceptable ways to behave. Let’s face it, having other people decide things for you can create feelings of powerlessness — and kids feel that just like anyone else. Not only that, but many times children don’t know how to get what they want from other people appropriately or how to deal with different situations. So, at times kids will say ‘I don’t care,” merely as an expression of their feelings of powerlessness. How to handle it: Don’t take their words at face value and don’t make it that easy for your child to convince you that you don’t have power. There needs to be consequences for behavior. Don’t let your child manipulate you out of holding them accountable. Situation #3: This next one is huge, and the most common trigger that I come across on the support line. If you’re not using time and task-oriented consequences, then your child has no goal to work towards in order to regain privileges. With no goal or end is sight there isn’t a reason for your child to participate in working on the behavior. They give up and basically don’t care what happens, because they don’t have any investment in producing different results. Not only is it important to be clear on what will go on restriction for certain behaviors, but it’s just as important to lay out exactly what your child will need to do and how long they will need to do it in order to obtain a normal status again. 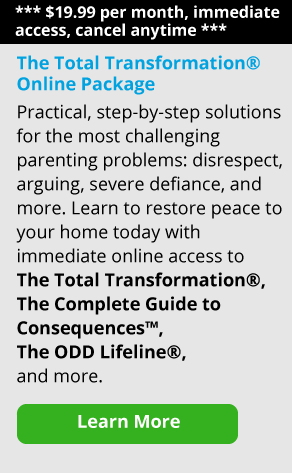 As a parent coach, Tina Wakefield coached parents on techniques from the Total Transformation, as well as Empowering Parents' other programs, for over 8 years. Tina is also a mother and stepmother. 1. How Do You Handle Your Negative, Complaining Child? 2. Ask Parent Coaching: My Whining Kids are Driving Me Crazy!